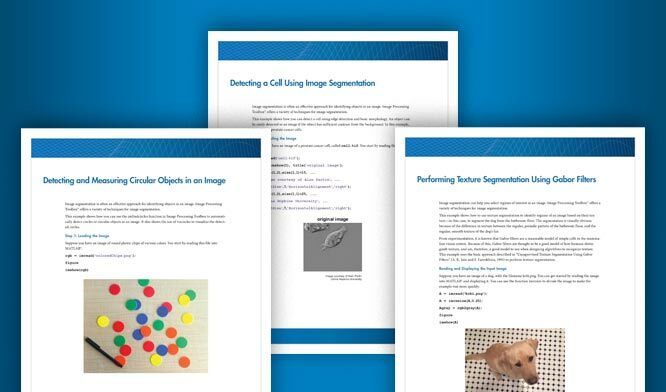 Hundreds of functions in MATLAB® and dozens of functions in Image Processing Toolbox™ run automatically on a GPU if you supply a gpuArray argument. Whenever any of these functions is called with at least one gpuArray as an input argument, the function executes on the GPU and generates a gpuArray as the result. You can mix inputs using both gpuArray and MATLAB arrays in the same function call; the MATLAB arrays are transferred to the GPU for the function execution. The following table lists all the Image Processing Toolbox functions that have been enabled to run on a GPU. In most cases, the functions support the same syntaxes and operate the same, but in some cases there are certain differences. This table lists these limitations, if any. bwdist Input images must be 2-D and have less than 232 elements. Euclidean is the only distance metric supported. edge Canny method is not supported on the GPU. gpuArray input must be of type uint8 or logical and the structuring element must be flat and two-dimensional. The PACKOPT syntaxes are not supported on the GPU. imfill Inputs must be 2-D, supporting only the 2-D connectivities (4 and 8). Does not support the interactive hole filling syntax. imhist When running on a GPU, imhist does not display the histogram. To display the histogram, use stem(binLocations,counts). imreconstruct Inputs must be 2-D, supporting only the 2-D connectivities (4 and 8). imregdemons The parameter 'DisplayWaitbar' is not supported on the GPU. imregionalmax Inputs must be 2-D, supporting only the 2-D connectivities (4 and 8). imregionalmin Inputs must be 2-D, supporting only the 2-D connectivities (4 and 8). imresize gpuArray input must be of type single or double. Only bicubic interpolation is supported on GPU and the function always performs antialiasing. The 'bicubic' interpolation mode used in the GPU implementation of this function differs from the default (CPU) bicubic mode. The GPU and CPU versions of this function are expected to give slightly different results. iradon The GPU implementation of this function supports only nearest-neighbor and linear interpolation methods. medfilt2 Padding options are not supported on the GPU. regionprops gpuArray input must be a 2-D logical matrix or a 2-D label matrix. The connected component structure (CC) input is not supported. The following properties are not supported: 'ConvexArea', 'ConvexHull', 'ConvexImage', 'EulerNumber', 'FilledArea', 'FilledImage', and 'Solidity'. 'struct' is the only return type supported. stdfilt The filtering neighborhood must be two-dimensional.